In this project we have designed and analyzed a refrigerator using LPG as refrigerant. As the pressure of LPG is high this stored in cylinder. As this pressurized LPG is passed through the capillary tube of small internal diameter, the pressure of LPG is decreased due to expansion and phase change of LPG occurs in an isenthalpic process. Due to phase change from liquid to gas latent heat of evaporation is gained by the liquid refrigerant and the temperature decreased. In this way LPG can produce refrigerating effect in the surrounding. 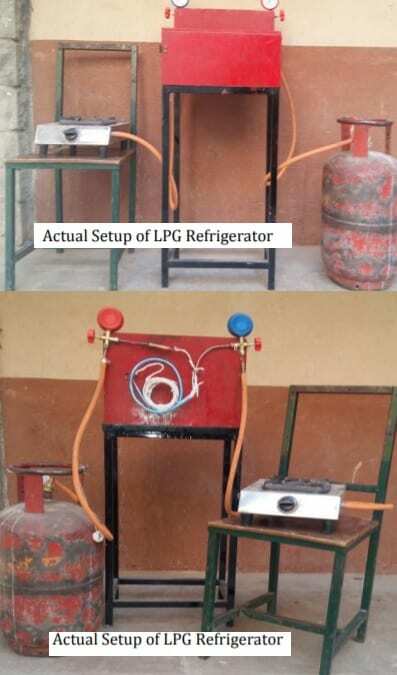 From experimental investigations, we have found that the COP of a LPG Refrigerator is higher than a domestic refrigerator. Due to the huge demand of electricity over the world, we think of recovering the energy which is already spent but not being utilized further, to overcome this crisis with less investment. The climatic change and global warming demand accessible and affordable cooling systems in the form ofm refrigerators and air conditioners. Annually Billions of dollars are spent in serving this purpose. Hence forth, we suggest COST FREE Cooling Systems. LPG is stored in liquefied state in cylinder before its utilization as fuel. refrigerator comparing their performance characteristics parameters like pressure, temperature etc. in refrigerator and considering safety while conducting the practical experiment. It indicates LPG can be used as an alternative refrigerant to CFC 22 after performing the test on new system. 1) To identify the form of residual waste in traditional refrigeration system. 2) Compare the important characteristics between LPG refrigeration system and traditional refrigeration system. 3) To distinguish between the current existing refrigerator cost and estimated cost of LPG refrigerator. 4) The performance of existing refrigerator and LPG refrigerator is to be compared. The idea behind LPG refrigeration is to absorb heat from surrounding by using the evaporation of a LPG. The pressure of LPG which is stored in cylinder is at about 80 psi. pressure LPG is goes in the capillary tube from high pressure pipe. In the capillary tube this high pressure LPG is converted in to low pressure adiabatically i.e. enthalpy remains constant. After capillary tube, this low pressure LPG is passed through evaporator. In the evaporator LPG is converted into low pressure and temperature vapour form which absorbs the heat from the cooling chamber. Thus the cooling chamber becomes cools down. Thus we can get refrigerating effect in refrigerator. After that the low pressure LPG from evaporator is passed to the burner through high pressure pipe and we can use this low pressure LPG for burning for further application. In this project we use recompressed LPG cylinder instead of compressor. In this way we can achieve refrigerating effect from this system.